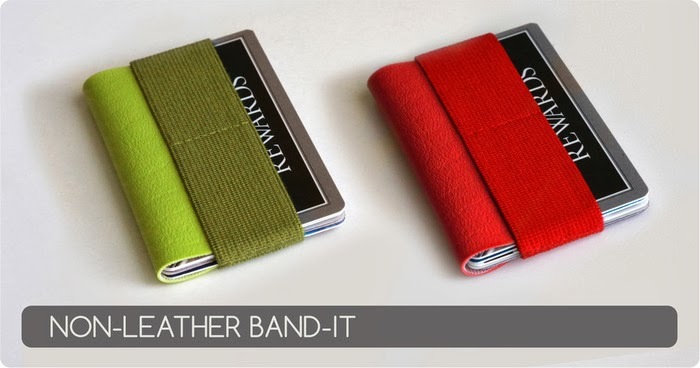 I was very excited when I saw the Band-it extra small minimal wallet on Kickstarter. It was such a novel idea and I liked the sheer simplicity of design. I ordered one of the non-leather versions as a change of pace and to experiment with other wallet materials. Where the Band-it suffers is in the details of it's construction. The vinyl used for my Band-it was very thick and detracts from the ultra minimalist concept that should define this wallet. I was frankly hoping a synthetic material would thinner, not thicker, than the leather shown in the Kickstarter video. This thickness is compounded by the method used to sew the opening which leaves a large gap between the front and rear cards. The video noted this gap as a feature that could be used to store cash but I found that space impractical and it detracts from the Band-it's use as a tiny card holder. The Band-it is a great conversation piece and a wonderful experiment in design. Many Kickstarter wallet campaigns have returned with a second design and I very much hope to see a new and improved Band-it 2.0 in the future.